It's easy to associate wine with romance, especially this season of hearts. However, unless you're a wine connoisseur, you probably don't know which vintage will go best with your dish on that dinner date with your guy. This month (or every Thursday of this month, at least), California Pizza Kitchen solves your problem by picking the perfect wine for you. What They're Known For: Operating in the Philippines since 1998, California Pizza Kitchen (CPK) is popular for its unique hearth-baked pizzas and pastas that incorporate flavors from around the world. CPK is also known for its California-style cuisine and the consistent high quality of its food. The Resto: The Shangri-La Branch has a warm and cozy feel. The tables are cushioned booths that give you a sense of privacy and intimacy. The casual atmosphere is comfortable and welcoming, and the staff is attentive and friendly. Who To Bring: Your boyfriend, family, or barkada, especially if they love pizza and pasta! CPK has something for everyone, and its pizzas and whole pasta servings are big. You can opt for half orders, too. Valentine Special To Try: While CPK has its fair share of bestselling dishes, today, February 18, and next Thursday, February 25, they offer selected wine and food pairings to stimulate your taste buds. 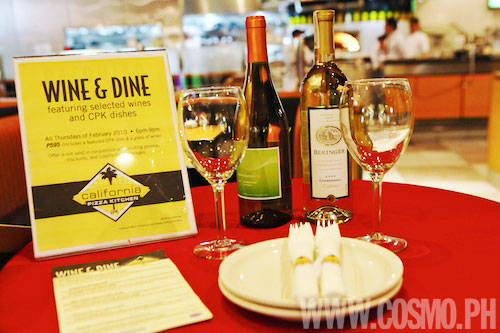 For only P595, you can order a CPK featured dish that will come with a glass of chosen wine. Try the Five Cheese & Fresh Tomato pizza which comes paired with a (big) glass of Robert Skalli Reserve Cabernet Sauvignon 2006, a deep purple red wine that is rich with spice and a tinge of cinnamon. If you think you'll be overwhelmed by the combined flavor of five cheeses (fresh Mozzarella, smoked Gouda, Monterey Jack, Mozzarella, and shaved Pecorino Romano), you'll find it's surprisingly delicate and light, with the sweetness and crunch of the freshly sliced Roma tomatoes perfectly offsetting the softness and saltiness of the cheese. The basil gives the pizza just the right touch of herb flavor. The Sausage and Pepper Penne Marinara is paired with a glass of Pepperwood Grove Cabernet Sauvignon 2007, red wine with a delicious berry smell and a hint of herbs. CPK's marinara sauce is subtle but rich and delicious. The penne pasta never tastes bland when paired with this sauce, and the sweetness of the onions and peppers balances the flavor and texture of the spicy Italian sausage. Tuna & Greens salad paired with Beringer California Chardonnay 2005, a white Albacore tuna salad on greens with herb-mustard Parmesan vinaigrette, apples, celery, onion, and Roma tomatoes. Singapore Shrimp Rolls paired with Beringer Chenin Blanc 2008, shrimp, broccoli, Shiitake mushrooms, and other vegetables wrapped in rice paper for dipping in sesame-ginger sauce. Miso Salad with Chicken paired with Pepperwood Grove Chardonnay 2006, with various greens tossed in Miso dressing. For more information, check out www.cpk.com.ph, and click through the gallery below for pictures of the delicious dishes.